If you’re a neat freak who likes everything to be hidden away and minimalistic then perhaps look away now – this is not the blog for you! However, if you like to see your lovely things out on display or just find that open storage makes it easier to find things (and forces you to keep it tidy because it’s out there for all to see!) then read on. Open storage can create real character in a kitchen – from orderly piles of pure white crockery to an eclectic collection of kitchen curiosities – they can add as much decoration as practical storage and of course you can swap what you display on them fairly easily so ringing the changes is a pretty simple process. Use as much or as little as you like – something as minimal as a single open shelf for herbs can add a nice accent or you can use it as your primary storage solution. Many kitchens offer an open storage solutions or you can add something contrasting that’s a standalone piece or even home made to provide an interesting juxtaposition of styles. There are no rules really. We have put together a few ideas which show a range of options sourced from the kitchens that we offer as well as ideas from around the net. As well as the small selection shown here, we have curated a wider range over on our kitchen shelving ideas board on Pinterest. These shelving ideas are part of your kitchen suite itself. The modular nature of a quality kitchen means that you can include as much or as little open storage as you like. Whether using this display space for decorative or practical purposes it can add an extra element to the overall look of the kitchen. Ensure you include this in the brief to your kitchen designer so they can build it in. This is shelving that you add to your kitchen separate to the kitchen suite itself. This could be a piece of free standing furniture or a DIY project. There are some really interesting ways of doing this such as stacking crates or building shelves out of piping or reclaimed materials such as scaffolding boards or railways sleepers. These provide a middle ground between open and closed shelving where part or all of a cupboard door is glazed. It can save you time on dusting while still giving you an open display feel! Shelves can be put to good use where space is limited and a cupboard may be impractical. 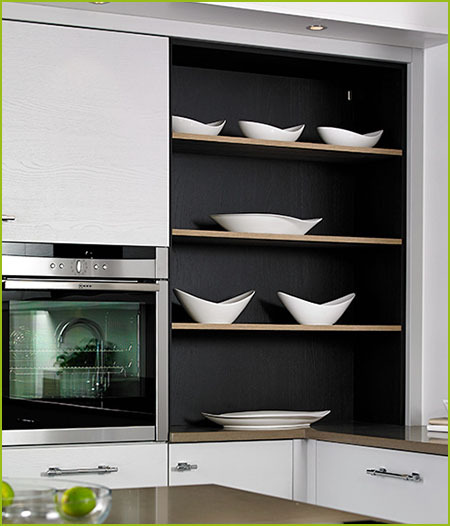 Very narrow shelves can be used for pots, cups or utensils and shelves can easily be fitted into difficult areas such as under stairs, around extractor units or around doorways where space can often be wasted. Great if you have a small kitchen and are struggling for storage space. We hope that this has given you some ideas. Please do check out our Pinterest board for many more including all of the images featured above. We’d love to chat to you about your own specific ideas and thoughts and we can build those into a bespoke design for you at no charge with a design consultation. Request one here or simply give us a call on 0800 321 3491. 0 Responses to "Kitchen Trends Blog – August 2017"